Uncovering Food: Sweet Treats and Safeway $$$ Giveaway! Sweet Treats and Safeway $$$ Giveaway! With the insanity of the post-season debate preparation, cooking has unfortunately been on the back burner. 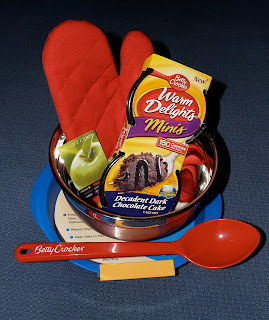 But trying to control my portion sizes and reducing how often I eat out has also been important to me, so when MyBlogSpark, Safeway, and Betty Crocker gave me the opportunity to try out Betty Crocker's Warm Delights Minis, I jumped at the opportunity. Like my disclaimer at the bottom of my blog says, I am always willing to try things, but I am not always willing to share them with my Uncovering Food readers. In this case, the ease of preparation and the individual portion sizes along with the great taste were selling points so I had to tell you about it! Seriously, look at this baby! Check out that chocolate goodness! And at only 150 calories for a bowl, it killed my chocolate cake craving with out killing my caloric budget for the day! It comes with a cake mix and dark chocolate fudge pouch. You mix the cake in the provided plastic bowl and microwave for only 30 seconds! It fit in my suitcase and was easy to prep in my hotel! Check it out! This whole thing for 140 calories, 4 grams of fat, 2 grams of fiber and 2 grams of protein. My only concern is the half gram of trans-fats. However, I am realistic. When I am traveling and craving a giant gooey piece of cake while I am out with the students, I can either give in and eat the cake or tide myself over knowing I can have a portioned cake in my room. If I am not going to forgo the cake and it is a once-in-awhile treat, a half gram of trans-fat is a small price to pay. This may be a deal breaker for some folks, but since my life is super hectic and I try to minimize processed foods, it is something I have to compromise on. So I found these babies at my local Safeway, and MyBlogSpark tells me that Safeway and their sister stores are offering some sweet deals on Betty Crocker products. I hear that Betty Crocker SuperMoist Cake and Traditional Brownie Mixes at the special price of $0.69 although it ends pretty soon! In addition to giving me a chance to try out these delicious treats, I was also given an opportunity to share a prize pack with you! While you won't get the Warm Delights Minis, one winner of Uncovering Food will get the chance to win everything else pictured below! A stainless steel mixing bowl, mixing spoon, silicon baking pan, oven mitt, and a $25 Safeway gift card!!! Read below on how to enter. The contest will end on Monday, April 12 at midnight PST. Good luck! 1. Leave a comment about what your favorite Spring snack is. This is required before you can gain additional entries. 2. Link back to this contest on your blog and share the link below in an additional comment. 3. Become a fan of Uncovering Food on Facebook. Share that you've joined the crew (or are already a fan) in an additional comment below. 4. Follow Uncovering Food using the Follower box on Blogger. Let me know in an additional comment when you start following (or if you are a follower). This also gives you entry into my monthly follower contests! 5. Follow @UncoveringFood on Twitter and tweet the following: "I want to win grocery money and baking goodies @UncoveringFood http://www.uncoveringfood.com/2010/04/sweet-treats-and-safeway-giveaway.html"
Favorite spring snack - mixed berries (straw/blue/black/rasp)! My favorite spring snack is strawberries with chocolate! Yummy! My favorite spring snack is homemade brownies. Strawberries and whipped cream is my favorite spring snack (or dessert!). fave spring time snack is guacamole! i LOVE those little chocolate cake bowls. amazing. i keep them in my top cupboard to avoid eating one every day. my fav. springtime snack is definitely frozen fruit and/or popcicles. when i'm feeling ambitious i even make my own popcicles. yum. just became a fan on fb! thanks! Really a chocolate goodness!!! I want it !! My favorite spring snack is popcorn! I became a fan of Uncovering Food on Facebook. My favorite spring snack? Peeps. How did I NOT get this update??? I think im right on time, no? My fav sprintime snack? RAINBOW ICES!!!! aaaand I am a fan on FB! My favorite spring snack is fresh strawberries from my garden with whip cream on top!